So I go into my study this morning, all ready to post something up here, and what do I find? That Frontlinegamer has beaten me to it! Ah well, great minds think alike, as they say (and fools seldom differ). It was, I suppose, inevitable. I spent a large part of saturday wandering round the Derby convention with Jody (who is the Clark Kent incarnation of Frontlinegamer), and we visited most of the same stands. The Sarissa Precision stand was one of the highlights for both of us, and though Jody knew of them before it was all new and shiny for me. Smelled nice too, of wood and ash; the smell you get when you start to lay a new wood fire and disturb the ashes of the old. Still, I’d been very organised and had even put out the lovely little jail ready, so I shall not be swayed from my course. Do, however, have a look at Frontlinegamer too, as he’s got more of their buildings as well. 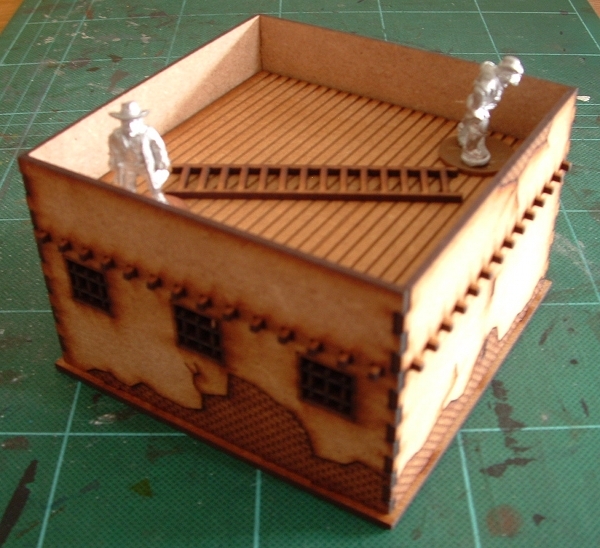 Sarissa Precision make a variety of laser cut buildings in a growing selection of ranges and scales. 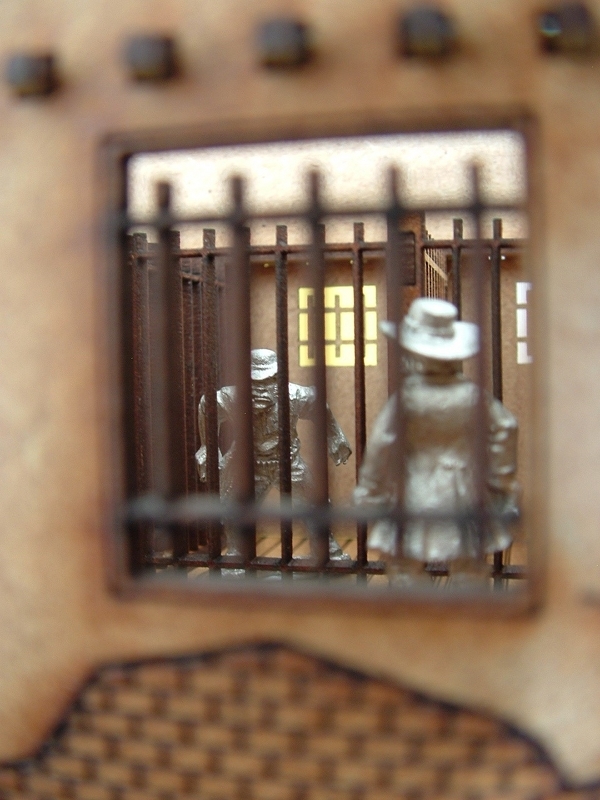 They started with Old West, and the jail was the one that particularly caught my eye. They have most of an Old West town already in their range (have a look at this), and the bits they were planning to finish it off were a barn/livery stable and railroad station (with cunning round water tower). I think it looks really good indeed. Of course, they say Old West, but you could use it for ACW as well, Jody was touting his for Malifaux, and you might even be able to squeeze one in a pirate game if you tried. 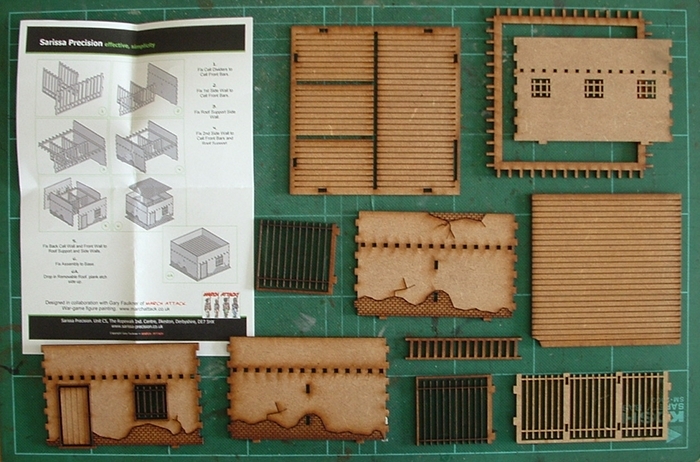 The buildings come in a choice of scales, which mainly means different door sizes, so you can scale the buildings to fit the look of “true” 25mm figures or the heroic 28s depending on your manufacturer of choice and basing style (the one I have here is labelled “Heroic”). That seems a pretty good idea to me, and something I’ve not seen as well developed elsewhere. Given the variance in size of models it’s a pragmatic approach that leaves gamers with enough choice to find the perfect fit for them. The building is like a miniature piece of flat-pack furniture, so if you’ve ever built anything from IKEA then you’re laughing. Here are all the bits laid out. I’ve left a couple upside down so you can see what they look like on both sides. As you can see, there is an instruction sheet included. This is excellent, with very clear illustrations and a picture of the finished article on the other side. If the standard of the rest of their range matches this then it’s going to be really easy to assemble even the bigger buildings. The jail, however, is only little, and took me perhaps 3 minutes to assemble without glue or tools. Very easy indeed. You should be careful of putting too much pressure on the cell bar pieces before they are in place, though I never felt that they were going to break (I’m just advising caution). Speaking of the bars, they’re nice and delicate as you can see in this shot of Sheriff Justice P. Goodbody talking to a local troublemaker. The roof is designed to be left loose so that it lifts off and you can get inside. 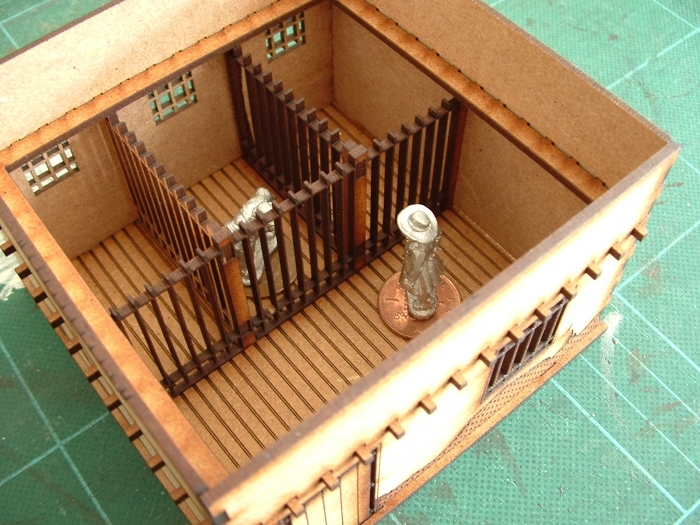 The rest of the jail could be glued to make it a little more solid, although it is designed in such a way as to not need glue. 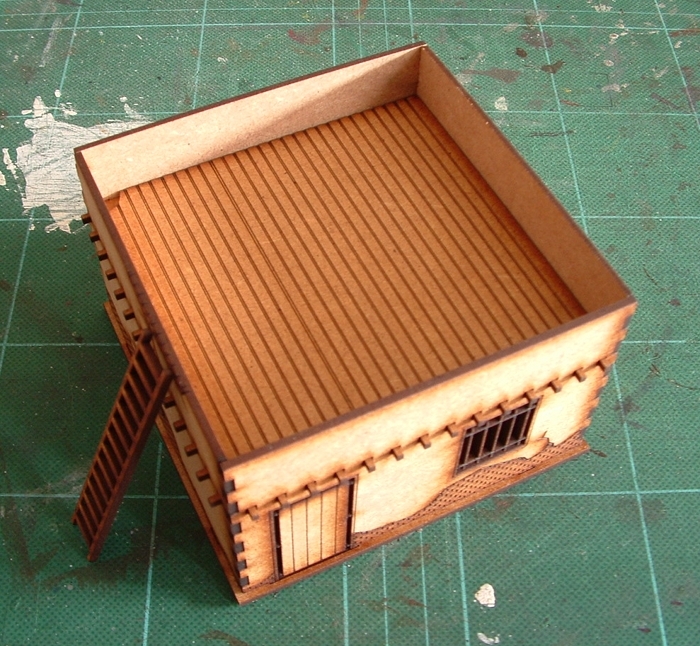 The chaps I spoke to on the stand at Derby suggested that you could actually leave them unglued and then dismantle the buildings after play so that they packed away into a small space for storage or portage. From the front you can see the relative size of the models. 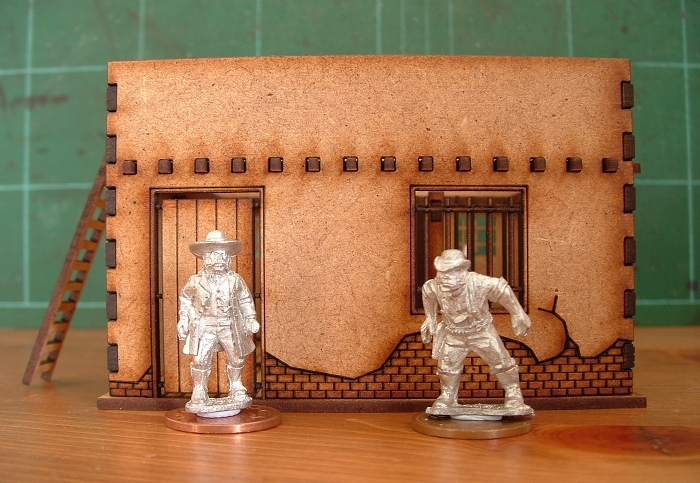 These are Old West Foundry models, which are a little smaller than their new ones. Still very usable pieces though, with lots of character. You can see how much difference your basing technique will have on size of model compared to the doorways. Incidentally, the doors are held in place by a handful of tags which are sturdy enough to keep them in position, but which offer the option of clipping them out if you choose. Naturally I’d want a fully functional, opening door, really, and I’ll have to decide if that’s practical. I’m sure someone will work out how to magnetize them. People seem to magnetize everything these days. Once you’ve dropped the roof back on you can position models up there. You even have a ladder in the kit for them to get up there with. The whole building kit has been carefully thought through, and it shows. Obviously these buildings are supposed to be painted, and I’ll get round to that. Not sure what the best approach is as this is my first HDF building. I don’t want to use so much water that it warps. Mind you, on the plus side, the building is pretty sturdy once it’s assembled, and if glued it will be even more so. Unless I stick it under the tap I doubt that I’ll have much problem with warpage. I crept closer and peered through the window. It was Sherriff Justice P. Goodbody, talking to his “guest”. There was an air of palpable tension (and clichés) in the air. The I saw the troublemaker had a six-shooter – it was a jail break! OK Sheriff. Go fer yer guns! This entry was posted in ACW, Old West, Terrain. Bookmark the permalink. I agree with you, the Sarissa Precision stuff is actually really quite nice. However the Jailhouse is arguably the best Wild West building they do. Love it. Not having more of them I couldn’t say for sure. 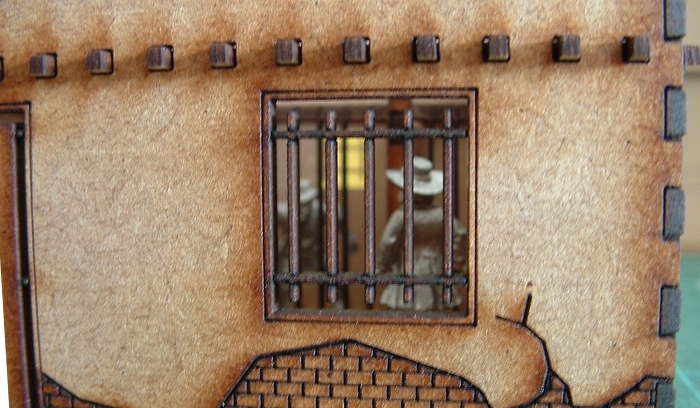 I thought the jail looked like the most eye-catching because of the interior detail. Whether that is the same as best I’m not sure Probably the best thing is the whole set as a town with all the different shops and a church and so on. That would look grand. I know… that’s why I got 2 shacks, the Jailhouse, 2 small shops, 1 medium shop, 1 church and 1 hotel. All I need now are a few more shops a big saloon and a livery stable!!! Reach for the sky pilgrim. And a railroad station. Don’t forget 3:10 to Yuma! All can be found here, feedback much appreciated. Quirkworthy, you sent me a message through our website but didn’t enter an email address so I could respond and take up the offer. Um, OK. I did enter one as it won’t submit it without, but not in the body. I’ll try again. 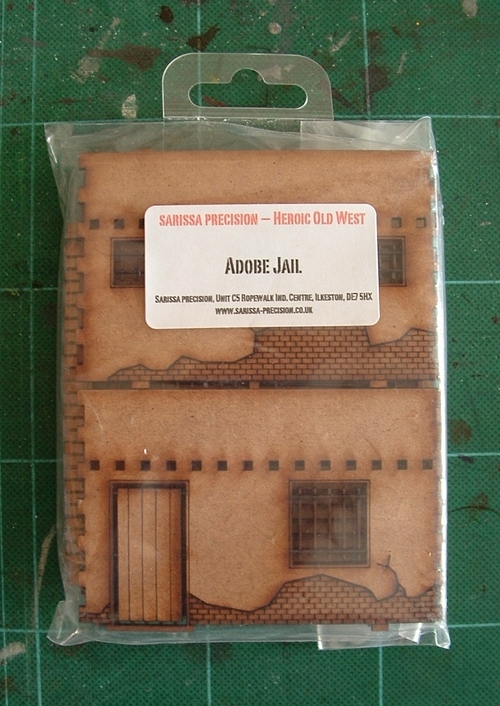 Thats a lovely looking jail house, wild west gamers will love this stuff. And there’s a whole town of it. Yee-har! Damnit, Jake! I’ve just paid off my credit card and now you’re making me want to put a substantial dent in it. Seriously, though. 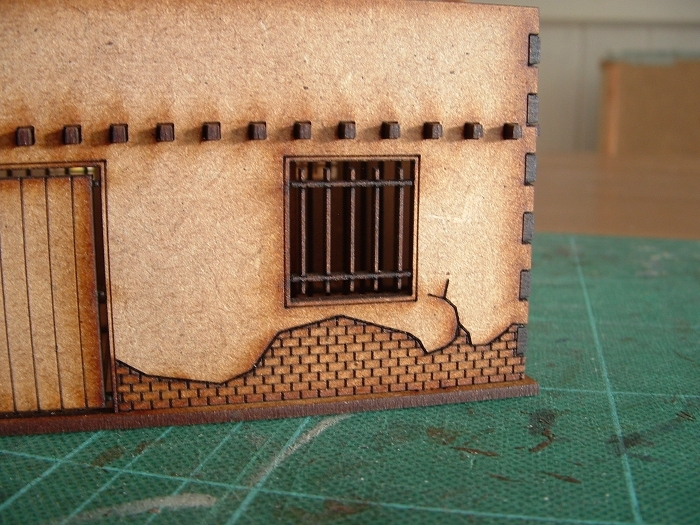 The Heroic scale buildings look to be a perfect size for Malifaux, as well as Legends of the Old West. I might have to write up a wishlist for Santa (aka the missus). I look forward to seeing how these look when painted. Don’t blame me, blame Sarissa Precision for making such nice stuff! Fair enough. :p I’ll also blame the British Pound for being so weak and the NZ Dollar for being so strong, making them an even better deal! Ah, the vicissitudes of international finance! A temptation to the purse, and no mistake.